The City of Laurel has joined other cities across the nation in recognizing the vital role volunteers play in the community. Mayor Johnny Magee expressed his gratitude to the dedicated citizens on Tuesday, April 2 by declaring April 7 – 13, 2019, as National Volunteer Week. 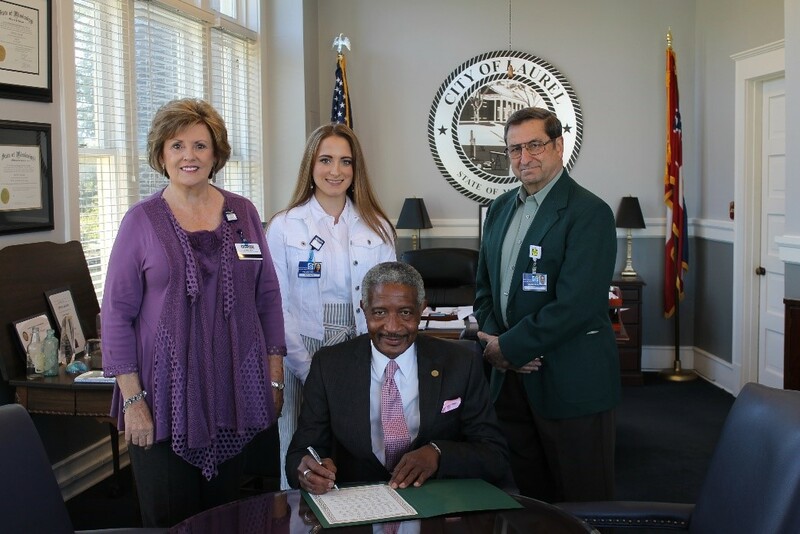 He signed the proclamation for South Central Regional Medical Center, a place he said volunteerism is most evident. Pictured (left to right): Bonnie Smith, SCRMC Volunteer Services Coordinator, Mary Hanna, Caring Teen Volunteer at Jones County Rest Home, Rich Hollingsworth, Volunteer at ComfortCare Hospice, and Mayor Johnny Magee (seated). Volunteers serve in a number of ways throughout South Central. During the 2018 year, over 75 adult volunteers and 30 Caring Teen volunteers gave more than 10,209 hours of service to the South Central Health System. SCRMC will celebrate the volunteers at an awards ceremony on Thursday, April 11th, where they will be recognizing their commitment to the health system. If you are ready to experience these benefits, South Central Regional Medical Center invites you to apply to become a volunteer. Volunteering for SCRMC offers many opportunities of service for individuals, ages 16 years old and up. To apply, please visit scrmc.com/community/volunteers, email bsmith@scrmc.com or call 601-426-4704 today.